I keep social media more updated so follow my Facebook art page! as I don't write here very often. Next weekend I'm being a part of the Bowerbird Design Market. If you're in Adelaide, come along and say hi, it's a great show! 2018 has flown past! I've had fantastic opportunities to stretch my illustrations with playing with new techniques and styles. I've discovered painting on smooth flat timber is amazing! Running the Gallery One children's art workshops in the term was a thrill and pushed me to rediscover print making and mini-sculpture. Loved working with really small groups after teaching in the classroom. Visiting schools for book week was a thrill, Craigburn Primary had a brilliant program with authors and illustrators everywhere! I popped in to see students at Sunrise and Walford and a bit further away, was part of the children's program at the Sharjah International Book Fair in the AUE. 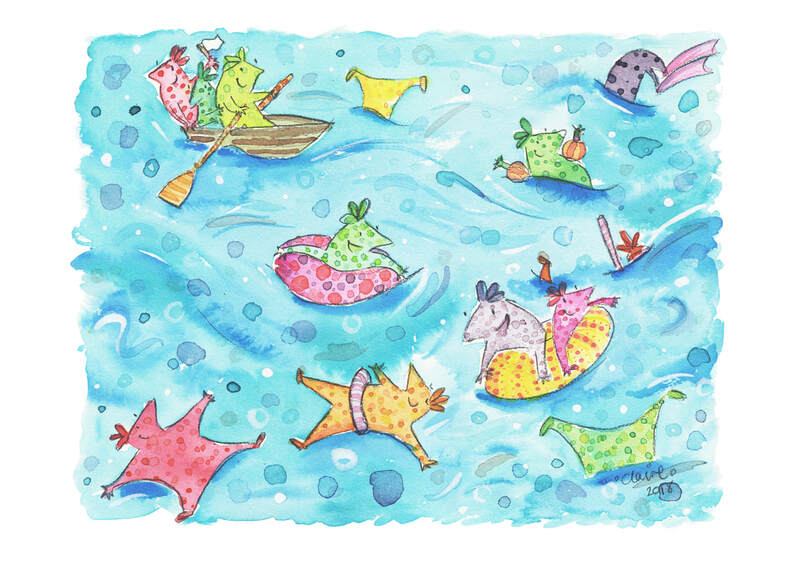 This year has been a year of writing and sketching future picture books. My draw of storyboards and polished picture book manuscripts is growing, excited to which one's will capture a publishers imagination and turn into real books. I have completed my first self-published picture book, Pippi's Zippy Car. I'm very proud of how it's come together so apologies in advance for excessive spruiking in 2019. This year was a filled with group Exhibitions. I've worked on a couple of series, returning back to caravans and then getting sucked in by the interesting shapes of succulents and quirky botanical painting. My hobbies and work seem determined to intertwine with my art now connecting with my enjoyment of gardening. Bernie & the Birds - Debut Graphic Novel - Now Available on Etsy! The first book I've both written and created is finally finished! Bernie works at an airport and has always wanted to fly but she's not interested in going up in a place. She wants to fly like a bird. Bernie sends away for some paper wings which apparently allow you to fly. A graphic novel created with a collage of illustration styles. I love painting and sharing new techniques I'm excited about. So, I am running a couple of workshops at Brick and Mortar Creative in Norwood. 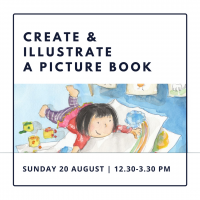 Or come along to create watercolour portraits on the 13th which can be a great intro into the last workshop on the 20th, spend an afternoon creating your own picture book! Funny Bunnies will be on show at Urban Cow during the 2015 Adelaide Fringe. This new collection of watercolour cartoons features particularly whimsical children enjoying peculiar hobbies and going through ‘awkward phases’. Funny Bunnies contains high quantities of super cute pets, nostalgic references to obsolete technology and a series in the show will be a series of portraits of Fringe comedians as children. Visit the Facebook Event or Gallery Webpage For More Details. 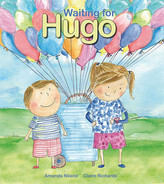 'Waiting for Hugo' has been shortlisted for the Speech Pathology Australia Book of the Year Award as well as receiving a good review in Reading Time. Click here to read the review.